I still remember the first time I tried homemade whipped cream. I’m talking about the REAL stuff that wasn’t bought at a store. It tasted just like ice cream only lighter and somehow richer. Once I tried it I knew that I could not go back to the fake kind or the canned kind. Just like that first experience with real whipped cream; stabilized whipped cream is just as heavenly! 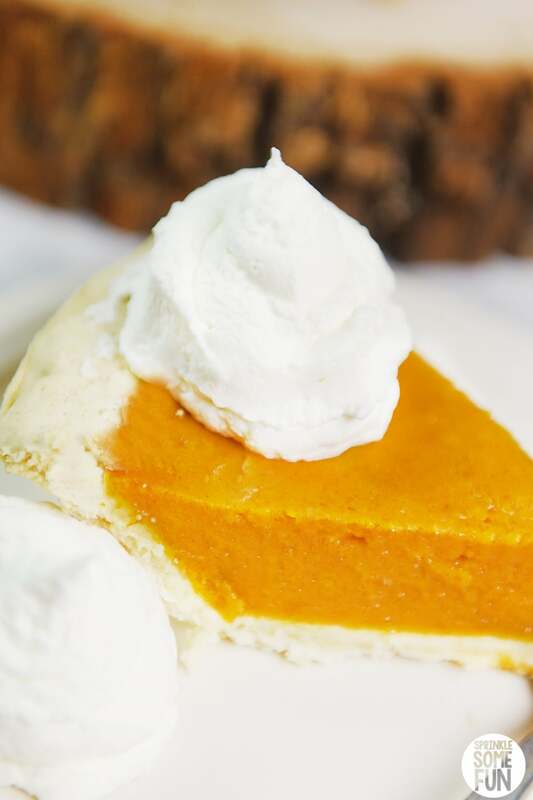 Real whipped cream is always the best for topping cakes, pies and ice cream! This recipe for stabilized whipped cream is delicious and will hold it’s shape for up to 24 hours. I like to make a big batch ahead of time for holidays such as Thanksgiving. The best part is that it takes only 4 simple ingredients that you can easily find at most grocers. In fact, the only difference between stabilized whipped cream and a typical recipe for whipped cream is the secret ingredient (well maybe not so secret now) which is gelatin! You only need a tiny amount to make a big difference in your whipped cream desserts. There is no taste difference at all which means that your guests will be left wondering how you made such an amazing whipped cream that doesn’t deflate in 10 seconds! Maybe it won’t get THAT much attention, but real whipped cream does always foster some mmms and ahhs. I always start my whipped cream out with high quality heavy whipping cream. 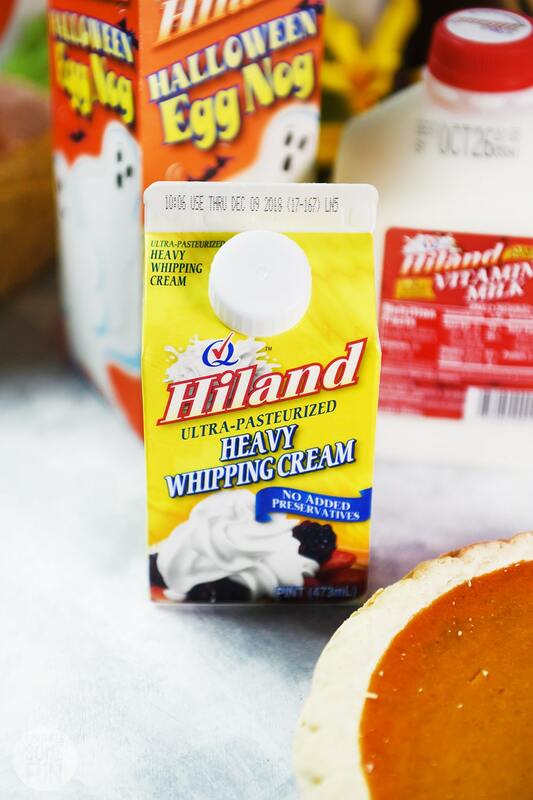 I like the Hiland brand because it’s local and easy to find in our grocery stores. 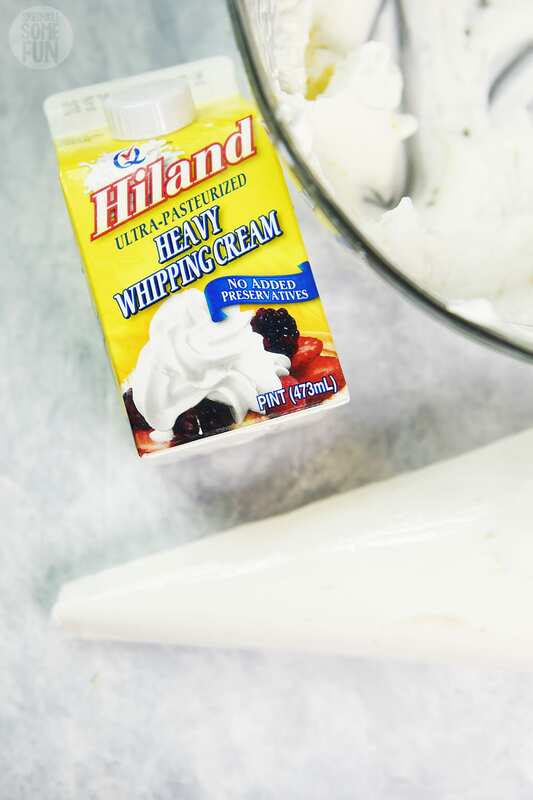 Hiland uses no preservatives in the heavy whipping cream and always tastes fresh. Hey, what can I say? I like shortcuts and sometimes I am all about the DIFM (Do It For Me) instead of always being a DIYer! Plus, when I make this whipped cream, which literally takes 10 minutes to make, no one ever notices wether I made the pie homemade or not! Are you more of a DIY or DIFM kind of person? 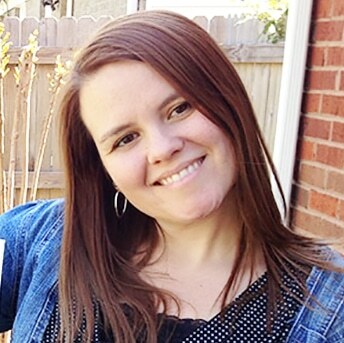 Check out this super fun quiz from Hiland to find out! 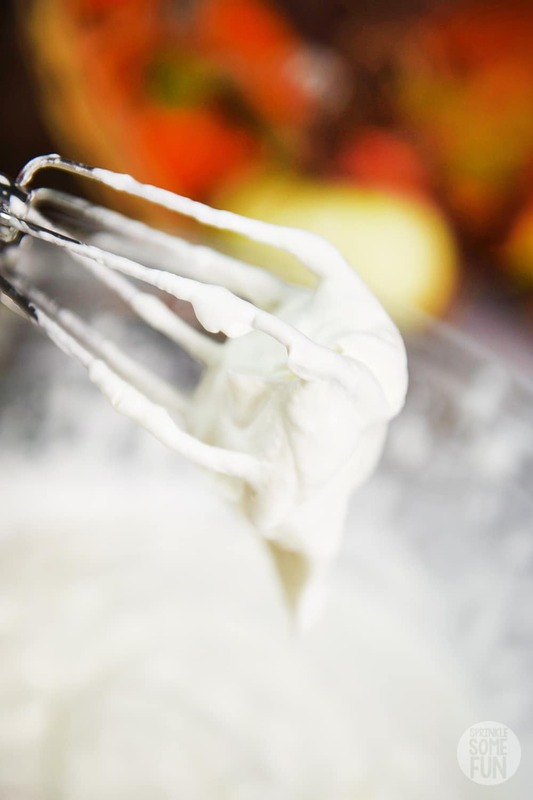 Stabilized whipped cream is great for putting on cakes and pies where you want the whipped cream as a decoration. The gelatin in stabilized whipped cream helps to hold the shape for a long time! Alternatively, I also put the whipped cream in a piping bag and everyone can use the bag to pipe their own whipped cream. I know at Thanksgiving we have people that either love a lot of whipped cream or just want a little bit. This is the perfect option for those that want just the right amount! Use unflavored gelatin as a stabilizer for your whipped cream. Unflavored gelatin has the best results because it will not alter the flavor of your whipped cream. You can usually find this kind near all the other gelatin dessert mixes. I’ve heard of people using 1 Tbsp. pudding mix to stabilize whipped cream, but I’ve never tried it. If you do try it then know that pudding mixes have both flavor and coloring added to them so they will alter the taste and color a little. 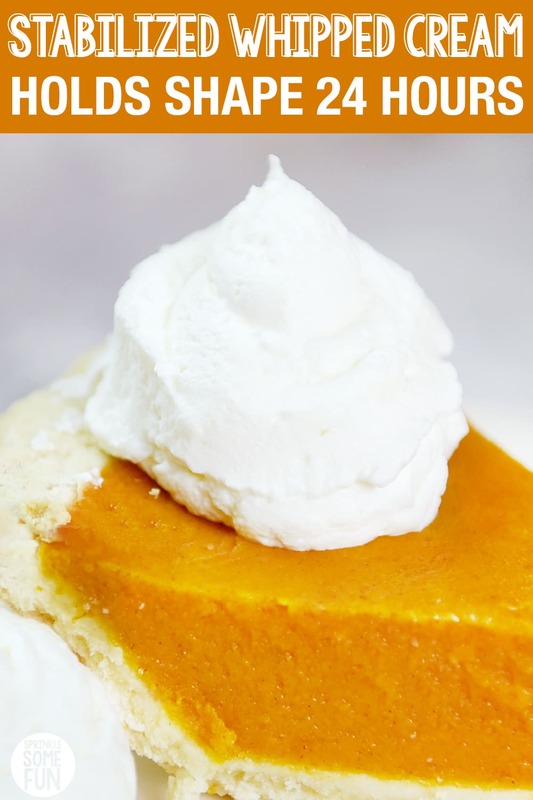 If you are having problems with the gelatin becoming stringy or clumpy in the whipped cream: try letting the whipping cream sit out to become a little warmer before adding the gelatin. This may be counter intuitive when making whipped cream, but the gelatin will allow the whipping cream to come to a stiff peak without it needing to be super cold. Some refrigerators run colder than others; so if yours is on the colder side then try this if you are having issues. Can you freeze stabilized whipped cream? Yes and no. If you are making a frozen dessert then it should be fine and will hold the same shape once it’s out of the freezer, but you cannot use the whipped cream for frosting or piping. Can stabilized whipped cream be colored? Yes, but the colors will be pastel unless you use powder. You can add a few drops of liquid color or gel color to the whipped cream, but the best results will be from using powdered colors so that you can add as much as you need without adding too much liquid. How long can stabilized whipped cream sit out? Since this is a fresh dairy product you’ll want to keep it out for up to an hour. After an hour or two you should refrigerate to reduce the risk of food poisoning. How long does homemade stabilized whipped cream last? In the refrigerator it will last for 2-3 days. In the freezer (remember it only keeps its shape after freezing and cannot be used for spreading or piping) will last for up to 2 months if well wrapped. 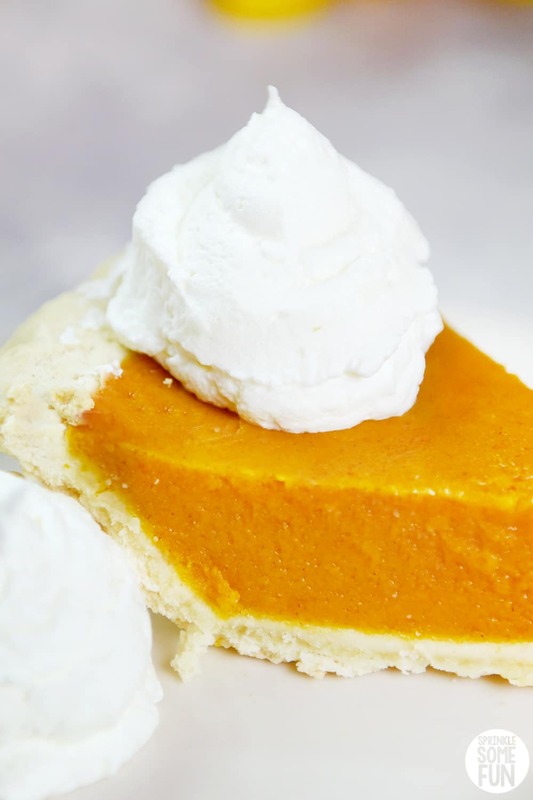 Want delicious and rich homemade whipped cream for pies, cakes, pastries and more? 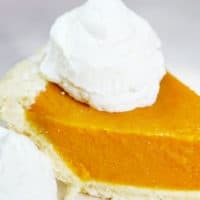 This is the best whipped cream recipe when you want a REAL whipped cream that will also hold its shape for a really long time. This is perfect for parties and holidays like Thanksgiving when you need a whipped cream that can stay whipped for longer than 10 seconds. You'll need a large bowl and hand mixer or a stand mixer with whisk attachment for this recipe. Take a small microwave safe bowl (ramekin sized) and mix in the gelatin and water together. Stir until all gelatin is wet with the water. Put this mixture into the microwave for around 5 seconds and stir. If the gelatin mixture is fully liquified then stir it and go on to the next step. If not, repeat heating the gelatin in the microwave for 5 seconds or until it is a liquid. The gelatin will be very hot so wait for around 2 minutes for this mixture to cool off a little before adding it to the rest of the recipe. In a large bowl or stand mixer bowl combine the heavy whipping cream, vanilla, and the powdered sugar. Start beating on high and while you are mixing; slowly add in the gelatin (it should still be runny at this point but not piping hot). This part is important that the gelatin still be liquid so that it mixes well with the rest of the ingredients. Keep whipping the cream mixture until you reach stiff peaks. Keep the mixture refrigerated until you are ready to use. You can use this mixture to ice cakes, pies and more. Use it in a piping bag and pipe with it too OR just use it to dollop it on your desserts. *If you do not have a microwave or want to try a different method: You can dissolve and liquify the gelatin in a small pot at a low temperature on the stovetop. Just stir until it dissolves and gets hot enough to liquify. Remove from stove and let rest for a minute and then follow the rest of the steps to make into stabilized whipped cream!